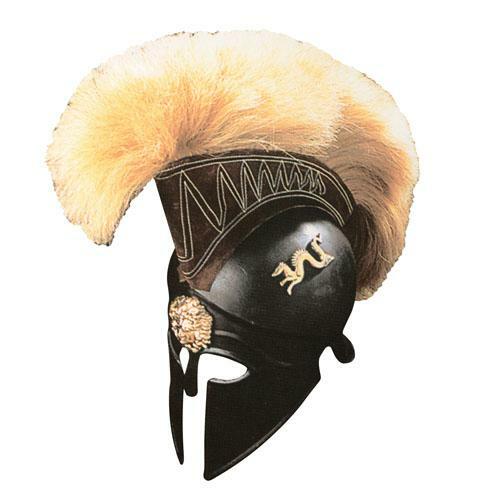 Corinthian type helmet greek-fifth century BC, with the ridge, and nasal paragnatidi fixed. Widespread in southern Italy after the importance of locally recruited from Greek colonies. The title "Royal" is used here to denote the rich decoration of this particular model. Made entirely of hand wrought iron and painted black on which are applied relief figures in gilt metal two dragons on either side and a lion's head in front. The crest is black leather hand-sewn with horsehair beige.